This guide is for version 1.2 of Creatures 3. If you do not have version 1.2, you can still get the patch (3.3 MB), courtesy of Gameware. Also, much of the information is relevant for the free Docking Station add-on, so it is also covered here. Be warned that much of the material is specific to Creatures 3, but there is much information that pertains to Docking Station. NOTE: You can of course download lots of free (and buy some non-free) unofficial add-ons for Creatures 3 and Docking Station. This guide does not cover them. 13.1.1 My eggs won't hatch! Don't have Creatures 3? Whether the answer is "yes" or "no", go and grab Docking Station -- now! It's an official, free online Creatures game which can optionally interface with Creatures 3. You can download it at CreaturesDockingStation.com. To play Docking Station online you will need to register for a free Docking Station ID. To play the game offline, you will need a login disabler such as the DS Offline Option. If you use the file shortcut to launch the game, you will also need to change that from InstallBlast (a defunct updating service) to engine.exe. NOTE: A section title with "(C3)" at the end pertains to Creatures 3, and a section title with "(DS)" pertains to Docking Station. If the section title has neither of these at the end, it's general information which can probably be applied no matter which game you're playing. There is no object of the game, really. Creatures is much more of a simulation than a game. It's like having a tank of intelligent Sea Monkeys, except you can stop the simulation whenever you want—no more having to rush home to feed your pets! There are three kinds of intelligent creatures available in the game: Norns, Ettins, and Grendels. Most players will choose to develop a community of Norns. However, there is no reason why you can't develop a community of Ettins or Grendels as well. Of course, you need to know your way around the ship if you want to fully explore the game. You can probably find most of this stuff out on your own, but it's listed here for completeness. The ship has four terrariums, plus the Bridge and Engineering sections. In both the Bridge and Engineering, you will find an airlock on the bottom deck. This is not useful except for giving a creature an execution, or getting rid of items that cannot be recycled. The Norn Terrarium: Generally, your Norns should stay here. You can keep Ettins here, too, but they'll wander home from time to time. The Learning Room, Crypt, and Recycler can be found here. The Jungle Terrarium: Nasty. The home of Grendels, poisonous plants, aggressive bugs and animals, and bacteria. To top it off, there's a death trap here: pressing the button takes away the bridge above the Piranha pond. This is handy for executing Grendels! If your eggs go missing, look for them in this terrarium. Some of the coolest power-ups are here, so if you want to get them, your Norns must brave the dangers! The Desert Terrarium: Home of the Ettins. If your gadgets go missing, they might be here. Beware the volcano. When it erupts, it produces heavy metal which is harmful (not unlike heavy metal music) and needs to be removed from the bloodstream. It is not a friendly place, because in addition to the volcano, there's no food to be found. The Marine Terrarium: Not much here, except for a few power-ups. You can experiment with the marine life. The Bridge: Lots of gadgets here, and more importantly, the Medical Bay is found here. Use it to help cure sick creatures. Engineering: This is where the major machines are found (except the Recycler). Not much for creatures here, except the Gene Splicer, but as the Hand, you can take advantage of the machines. If you want, you can totally ignore much of the game and just stay in the Norn Terrarium forever, caring for your Norns while oblivious to everything else except for the occasional Ettin or Grendel invader. But if you like, you might want to get all the cool stuff so handling Norns (and later, the Ettins and even the Grendels!) is easier, and so your creatures will be more intelligent. If you start with eggs, hatch them both using the Incubator and take both Norns to the Learning Room, and turn it on auto-teach. After a while, come back and switch to vocabulary set two - if your Norns are still there! But in the meantime, you'll want to explore and possibly construct some machines to improve the environment. One of your first priorities is to figure out how to handle Grendels when they show up. You can wait for them to come into the Norn Terrarium and have your Norns try to beat them up, but this isn't a good plan because you put your Norns at unnecessary risk, especially as Norns are not very aggressive at the start of the game. It's better to have machines doing their best to keep the Grendels out—or dead. One of the simplest ways to handle this is to take a scenton emitter to the Jungle Terrarium. The Jungle Terrarium already has a creature detector, but if you removed it, take one with you, too. 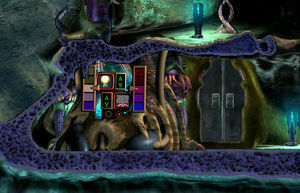 Have the creature detect Grendels and put it to the right of the trap door to the Piranha pond, next to the button. Connect the Grendel detector to the button (make sure the electricity is flowing in the right direction; if you did it wrong, try again using the other ports). Now the trap door will open whenever a Grendel is near. Plop the scenton emitter next to the Grendel detector and have it emit the smell of Norns. (Make sure it's active; you should clearly see and hear the scentons being emitted). This attracts the Grendels to the trap door, which is lethal for the Grendel if it falls into the pond: if there are Piranhas, it will be eaten alive, and if there aren't, it will drown! This is a very useful way to overpower the Grendels early on, but make sure you set at least one other trap in case this one fails (for instance if an Ettin diddles with the gadgets, or if a Grendel simply doesn't fall for it before going to the Norn Terrarium). Another, more complicated Grendel trap is demonstrated in the "gadgets" section. When you have a Norn that has reasonable speaking ability, start exploring the world and get all the power-ups (they shouldn't be hard to find). If a power-up is underwater, be sure that your Norn is wide awake. (Try the "alert" or "tired" commands to see how alert your Norn is.) If your Norn falls asleep while underwater, it will probably die before it can get out! You might want to get all the keys early in the game, because they let you do cool stuff! This doesn't apply to Docking Station, because C3+DS worlds don't have keys: you get their effects for free! Recycler key: Boosts Recycler efficiency by 25%. There are four of them. Creator key: Boosts Creator efficiency by 25%. There are four of them. Replicator key: Boosts Replicator efficiency by 25%. There are four of them. Gene Splicer key: Gene Splicer becomes active at 100% efficiency. That's right: this machine needs only one key! Ettin/Grendel key: Interact with Ettins and Grendels as you would Norns. You can find this in the Jungle Terrarium. Pickup key: Allows you to pick up Norns (shift and right-click). Ettins and Grendels can be picked up if you also have the Ettin/Grendel key. This is found underwater in the Marine Terrarium. To get to it, have your Norn walk along the beach to the far right, then press the button to allow it to descend into the water. Once it gets the key, just pick it up to take it out! You may want to make this one of the first keys you get, because you won't have to spend so much time gathering the others: just pick up your Norn, take it to the key, have it 'push' the key, and repeat until you have all the keys. The Creator creates new objects. The Replicator duplicates existing objects. If asked to replicate a blueprint, it will produce all the parts that the blueprint specifies instead of copying the blueprint. The Recycler recycles objects by converting them to bioenergy. Some objects cannot be recycled, like Grendel eggs (darn it!). The Recycler isn't necessary if you're running Docking Station. The Gene Splicer combines the genes of two creatures to produce a third creature. This can produce bizarre results. For instance, you can combine a Grendel and a Norn! The resulting creature will always be classified as one of the three main species, however, depending on which traits are more dominant. WARNING: Using the Gene Splicer will kill both of the Creatures! Are you willing to destroy life in the name of science? You make the choice. Gadgets can be really helpful, but it can be difficult to figure out what to do with all your inventory items! If you have something useless and the recycler is at 25% efficiency or above (in other words, if it's working at all), you can of course recycle it. But just what can you do if you want to use something instead of throwing it away? What can be done with the machines? Well, let's find out! One of the most useful machines early on would be practically anything that can kill or imprison a Grendel. The manual even has an example of such a machine: A Grendel detector connected to the airlock door button, next to a Norn smell emitter. The result is Grendels will go to the airlock because of the smell of Norns, and will be ejected due to the airlock. This is not a good design, though, because the machine's components will be ejected into space and explode! So what's a better way? Well, one idea may be to hook up a Grendel detector to the button that controls the bridge over the Piranha pond in the Jungle Terrarium. This will make sure any Grendel that steps on the bridge will fall into the pond and will either be picked to the bones or drown. But it's also important to keep Grendels from entering the Norn Terrarium. Well, you may have noticed the sludge gun in the Norn Terrarium. You can hook stuff up to it, like a Grendel detector. A Grendel detector will send out a signal that is more powerful the closer a Grendel is, and zero when there is no Grendel nearby. The signal will be positive if the Grendel is to the left, or negative if it is to the right. This is perfect behavior because the Sludge Gun works in much the same way! If the input is positive, it will shoot right, and if it's negative, it will shoot left, and how far it shoots will depend on the power of the signal. Therefore, if you hook the two together so the Grendel detector feeds into the sludge gun, the gun will fire repeatedly at any Grendel in sight, with perfect aim to boot! But wait! There's a problem. What if a Norn is next to a Grendel near the sludge gun? The gun might hit the Norn instead, and may very well kill it—Norns have actually died in this way! Maybe it's best if it doesn't fire if there are Norns nearby. To understand the example, though, you will need to understand Boolean logic. AND, OR and NOT Gates. You may already know what "AND", "OR", and "NOT" gates are. If you're a programmer, these are the boolean operators you know and love (0 is false and +255 is true). But if you have no idea what these things are, or if you want to make sure you got it right, or if you're just bored, read on. A wire connecting two machines always has a signal going through it, with a value from -255 to 255. A value of zero acts like the machines aren't connected at all, because (to put it in real-world terms) there's no electricity going through the wire. In the bridge of the ship you've probably noticed a few small gadgets with yellow pictures on them, and some of them take two inputs! This is the AND/OR gate. The other one has a triangle shape on it and only takes one input. This is the NOT gate. We'll discuss the NOT gate first because it's the easiest to understand. It can output one of two signals: 0, or 255. In other words, the output is in binary: it's either all the way on, or all the way off! But how does it know what to output? Simple. It checks the input. If the input is zero, it outputs 255. If it's nonzero, it outputs zero. Strange, right? Not really. The NOT gate is actually pretty logical. It produces output when there's no input, and produces no output when there is input. Therefore, if a Norn Detector outputs a signal when there's a Norn nearby, if you route the output to a NOT gate, the gate will produce a signal when there are aren't any Norns nearby... but it will stop when one gets near. This way you can have something happen as long as there aren't any Norns around... like the firing of a sludge gun. Now the AND and OR gates. These take two inputs, which is why you can get the AND and OR gates together in one gadget, but the NOT gate must come separately. In OR mode, a signal will be output if either input is nonzero. In AND mode, both inputs must be nonzero. Neither of these gates produces output when the inputs are both zero. If you just don't get it, look at the following tables. It will show what outputs you get with certain inputs. F (false) is zero and T (true) is anything other than zero when it's an input, or 255 when it's an output. Connect a Norn detector to a NOT gate. Connect the NOT gate to an AND gate. Connect the AND gate to the sludge gun. Connect a Grendel detector to the AND gate's other input port. Voila! The gun will fire at full power whenever a Grendel is nearby... but, thanks to the AND and NOT gates, it will not fire when there is a Norn nearby. The machine can be improved further still. For instance, though this weapon will rarely if ever harm a Norn, it can still hit Ettins. This may not worry you. If it does, I'll leave how to rectify this as an exercise for you (here's a hint: the only additional equipment you need is an Ettin detector and an OR gate). Of course, you should be careful not to put all your eggs, or your gadgets, into one basket. Of course, you'll want to dismantle any Grendel-killing machines if you decide to start training Grendels. :) Keep in mind, though, that machines are useful for much more stuff than just killing Grendels. IF (Grendel is near AND (Norn is NOT near)) THEN fire sludge gun. How to connect the machines should then become apparent. Just one more thing: when you construct a machine like this, you can right-click it with the Agent Help and create a blueprint. This blueprint can then be put into the Replicator to make the required parts. You may want to export the blueprint by left-clicking it, typing in a name, and pressing Enter (it should say "Blueprint Exported"). This will allow you to use the Creator to re-create the blueprint if you need to... or to create it in other worlds! Alternately, you can train the Grendels, but keep them isolated in the Jungle Terrarium. To teach them language, use the Stones scattered throughout the world. You have to check up on them often, though to make sure they never wander outside the Jungle, and never let your Norns go in the Jungle once you start training Grendels! You may want to get a third-party agent that helps restrain Grendels. NOTE: Just because we discourage training Grendels and Norns together doesn't mean you shouldn't try if you want to. We're just making you aware of the risk involved. We'd be happy to hear from anybody who has had success with training Grendels this way! There are four kinds of disease: environmental, bacterial, poison, and genetic. For information on bacterial infection and poison, read the next section on the bloodstream. There are few genetic-related diseases. Most serious diseases result in death at or shortly after birth. If a hatched creature dies at or just after birth, this is what happened. Not much can be done about it. It's just evolution at work... well, evolution not working. Environmental disease refers to any problem caused by the environment. For instance, if a creature is drowning, it will be deprived of oxygen, which will ultimately cause the creature to run out of energy and die if nothing is done about it. Most environmental diseases, aside from simple aging, can be avoided with common sense, like not allowing a Norn to go into the water if it's tired... and not diddling with the environmental controls of the terrarium! What makes your creatures tick? Why do they get sick? Your creature has many essential chemicals in its bloodstream, but the most important one is ATP. It is ATP that gives your creature the ability to sustain life. ATP is gradually turned into ADP as energy is produced, so your creature must eat to allow ADP to be turned back into ATP. The most lethal toxins can attack ATP (or production thereof) directly. If your Norn dies after eating something, this might well be why. Creatures also get sick from bacteria that's floating around. While in real life, some bacteria is good, in Creatures, "bacteria" refers only to the malicious bacteria which will do bad things to your creatures. Most of the bacteria are in the Jungle, so never let your Norns wander around there, and when they do anyway, give them a checkup. If you must send the Norn in to retrieve a power-up, give the Norn a checkup before sending it in, because any diseases are likely to get worse in the Jungle. Also, Grendels are major carriers of bacteria, which is another reason to avoid them. When your creatures become infected, the medical scanner will show the presence of harmful antigens. They produce nasty chemicals like histamines (which cause coughing and sneezing), and the dangerous antigen 5 causes direct injury to your creature. Also, antigens attack organs directly. If the antigens are not removed in time, the organ will probably be damaged or even killed. The best way to fight antigens are antibodies. A creature's immune system should produce these automatically, but if you inject the right antibody (it has the same number as the antigen), you can help make the disease go away more quickly, which can be critical. A full list of chemicals can be found at the C3 Chemical List. Different kinds of food contain different kinds of chemicals. However, the kinds of chemicals in various kinds of foods are generally consistent. For instance, if an object is called food, it probably has high protein and fat. If it's called Fruit, it probably has high protein and some starch. If it's called seed, it probably has high starch, and if it's called weed, it is probably best avoided. Within a single category, creatures do not distinguish different varieties. That is, if a creature decides that cheese is good, it will also jump to the conclusion that carrots are good, too, because they're both called "food". It will however not form conclusions about apples, because they're fruit and not food. This is why you can expect varieties within general categories to be fairly consistent. Every creature has a genome. A genome is a genetic description of that creature, indicating the function of every gene. Most genes define organs and chemical reactions involving organs. Here's a little secret: almost every chemical reaction in the game occurs due to your creature's organs! In other words, without genes and organs, nothing makes any chemical different from any other. You could make creatures that breathe ATP decoupler if you want. The most basic form of genetic engineering is using the Gene Splicer on the Shee Ark. You can use it to combine the genomes of two creatures into a third genome, as though the two creatures mated. In fact, it's preferable to have the two creatures actually mate if you can, because they will die if you put them in the Gene Splicer! But the Gene Splicer also makes it possible to combine creatures that cannot mate—one might form a "Grettin" by splicing an Ettin and Grendel. The Genetics Kit also makes this possible, however, and it's now freely available, so you no longer need to subject your creatures to the Gene Splicer. Open environmental control panel in the Marine Terrarium. Each terrarium has a hidden environmental control panel. Don't mess with this unless you either really know what you're doing, or don't mind risking the destruction of the terrarium's ecosystem! There's a bonus "DJ Grendel" WAV file on the hard disk. Go to the sounds folder and open DJ_G.wav. If you type """ (that's three double quotes), as you would communicate to a creature, the hand will begin saying strange things. Starts a space shooter game! Provides access to a strange secret room. Others can be found at C3/DS CAOS Codes. If you have an egg that won't hatch, and you can't put it into the incubator, you may have reached either the creature limit or the breeding limit in your world. In Docking Station, you can increase these limits using the middle side panel. Raising the limit will allow the eggs to hatch, but of course the more creatures you have, the greater a tax the game is on your system resources. Sometimes upon starting the game you may get an error message like "Failed to create server thread", after which the game aborts. It may happen a couple of times in a row, and if it doesn't stop, try rebooting. It should not be a permanent problem requiring reinstallation, however. If you see an agent suddenly disappear, it was probably autokilled. This means there was a problem with the machine. Either the agent is buggy (shouldn't happen with official agents), or in the case of the Egg Layer or the Creator, there's a problem with the agents that can be created (files may be missing, for instance). If you uninstall Creatures 3, be sure that you delete everything in C:\Program Files\Creatures 3 (or wherever you installed the game) before reinstalling. If you don't, it's likely the Egg Layer or Creator machines won't work. And of course, be sure to install the version 1.2 patch afterward. This procedure probably isn't necessary for Docking Station, or if you are running an unpatched version of the game (shame on you!). This page was last modified on 16 June 2018, at 19:15.